The perfect way to enjoy fresh vegetables anytime of the year. 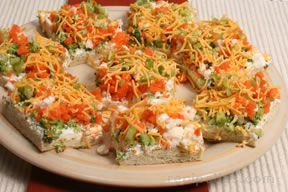 This vegetable pizza is perfect for sharing at a gathering of friend and family. Cover pizza pan with Reynold's Wrap. Spread rolls out to make crust. Cook according to directions; let cool. In a bowl, mix cream cheese and ranch mix and salad dressing together. Spread over crust. 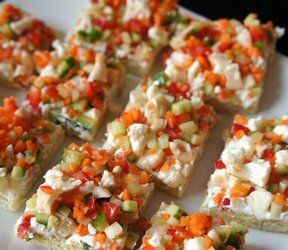 Cut broccoli, cauliflower, and tomatoes into small pieces and sprinkle over cream cheese mixture. Sprinkle shredded cheese on top of this. 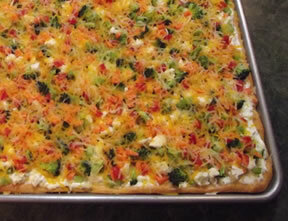 "I made this vegetable pizza for a wedding shower that I had for my sister. Everyone loved it and they ate just about all of it. I was hoping to have a little leftover but only ended up with 2 squares left and I had to share them with my husband."